Neoliberalism can be understood as the deregulation of the economy from political control by deliberate action or inaction of the state. As such it is both constituted by the law and deeply affects it. I show how the methods of historical materialism can illuminate this phenomenon in all three branches of the the U.S. government. Considering the example the global financial crisis of 2007-08 that began with the housing bubble developing from trade in unregulated and overvalued mortgage backed securities, I show how the repeal of the Glass-Steagall Act, which established a firewall between commercial and investment banking, allowed this speculative bubble to nearly bring down the world economy by promoting the creation of too-big-too-fail banks engaged in reckless and possibly criminal trading in exotic securities based on these subprime mortgages. When things collapsed, the government's decision to bail out the culprits who caused the crisis, but not its victims, and not to investigate or prosecute the banks responsible illustrate the way neoliberalism operates at the executive and agency level. 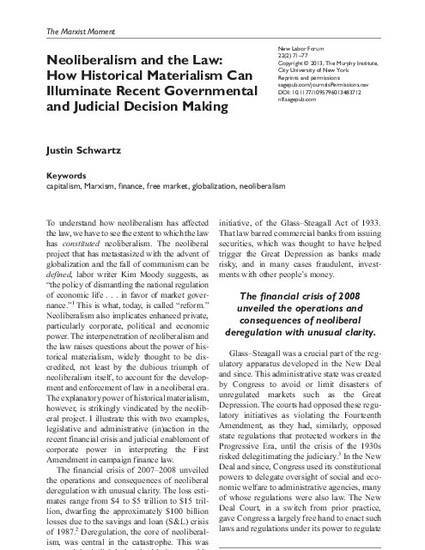 It also vindicates historical materialist theory about the role of the legislature and executive in a market society where productive assets are privately owned. I then turn to the way the judiciary have treated corporations in the area of free speech, particularly in the case of the Citizens United v. FEC (2010) case, by treating huge corporations with vast assets but which are nonetheless artificial entities as "persons" for the purpose of the Fourteenth Amendment, as equivalent to nature individual humans, and thus entitled to First Amendment protections. These include campaign expenditures (core political "speech"), restricted by statute up through Citizens United. But that case put aside the Supreme Court's previous worries about the risks of corruption or corrosion of democracy, despite clear empirical evidence to the contrary, and allowed these "persons" unlimited "speech" in the form of campaign expenditures. This illustrates both the historical materialist concepts of ideology, belief distorted by economic interest, as well as the further submissiveness of the judiciary to powerful economic interests, while showing, through the Court's early hestitations about this radical result, that the government, including the courts, have a logic and direction partly independent of economic power.